Hello Everyone! Today’s post is a little more personal and gives you a little peek into my background and my family and a little bit about how I got into creating. I really do feel like it’s in my genetics… I think there is a certain type of person who is naturally interested in “making.” It used to be a necessity of life and now it’s a little bit more of a luxury – a hobby – for fun. I don’t personally feel that way because it makes me a happier person when I am able to create – and thankfully I have been able to make it my job, which I feel so thankful for! My Great Grandma Dolly was a quilter. My Grandma Tracy recently gave my Mom (who is a more recent quilter) a quilt top that my Great Grandma Dolly had finished but didn’t complete the entire quilt before she passed away. 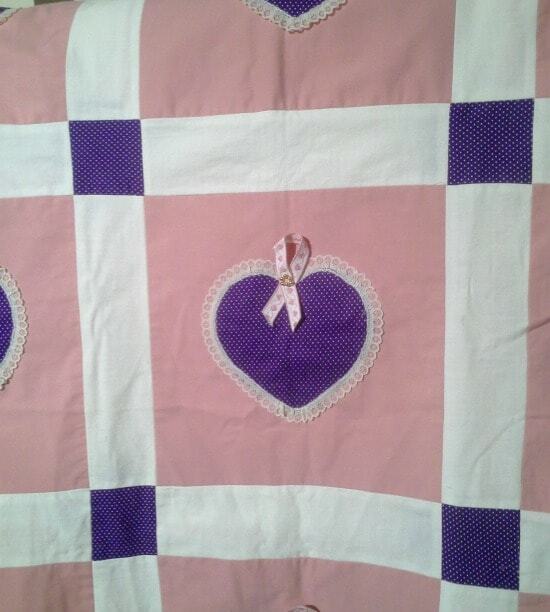 There were two identical quilt tops, one for me and one for my cousin Heather. So my Mom took the quilt tops and decided to modify it and modernize it a bit, but most of all, finish it. 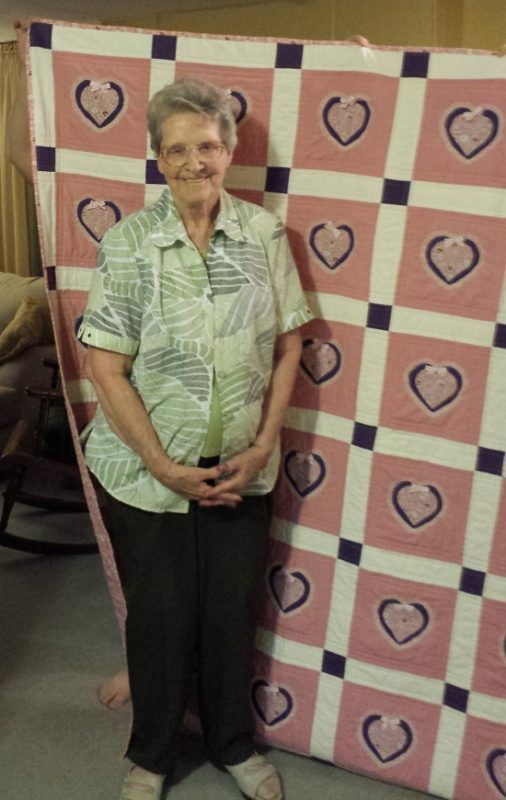 Here is my cute Grandma with the new and improved… and Finished quilt. My Mom surprised her on her last visit to Arizona where she lives with it all bound and quilted. So when my Mom came to visit in early October (after stopping in Arizona) she brought the quilt to give to me/Ainsley, just like my great Grandma originally intended – all these years later. Strange to think that there are 5 generations of women involved in this quilt. My great Grandma Dolly for originally designing it and making the top for me when I was a baby – my Grandma Tracy who has held onto it all these years and hoped it would get complete one day, my Mom for making the modifications, and quilting it and binding it to make it washable and usable – And of course me and Ainsley who will use it and love it and remember our grandmas when we see it. 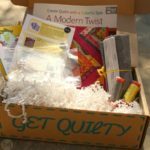 That is one thing I really love about quilting, it truly is an heirloom piece… something to pass down and use and love and remember and grow attached too. With Christmas next week, I hope we all can take a deep breath and spend quality time with our families… remembering what the season is all about and relishing in the nostalgia of Mom’s house or Grandma’s house and memories of Christmases past as well. May God bless our every stitch with love. I come from a family of quilters on all sides. 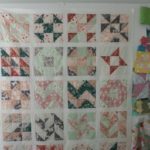 I have quilted since the mid 80’s when I did all piecing by hand as well as the quilting. Now, due to severe carpal tunnel, I do piece by machine now, and have for the past three years, but every quilt is hand quilted, each and every stitch, as I’ve always done. Sadly, I don’t believe I have anyone to carry on that tradition. I have a niece who treasures the bed quilt I made just for her, but others in the family don’t understand the value of the craft, the work and design thought that goes into each quilted item. You are very fortunate. And your family is beautiful. Keep creating! All the best, Cynthia in Mineral Bluff, GA.
Cynthia, your post spoke to my heart, and I had to reach out to you. All my life I have been drawn to my family quilts, tracing the patterns with chubby child fingers and pulling them out at every opportunity. Most of the quilts in my home were made by a great-aunt crippled by polio. She died when I was ten but to my knowledge we never met. Eight years ago I found out that a great-grandmother unrelated to her was also “a beautiful quilter” but I have never been privileged to see any of her work and probably never will, as no one knows where her work went after her death. I met her once – I was two. We lived close to my mother’s family with many wonderful and talented women, but none quilted. I tried to teach myself in elementary school, but it was a pretty hopeless attempt and the pieces were squirreled away after one summer. Finally last summer, after working up my nerve and watching hours of online video and reading oodles of articles, I dove in. My first quilt was completed on January 1, 2015, and given to my son’s best friend and his bride at their January 2nd rehearsal dinner party. They loved it; we all cried. It’s a lovely story ! Thank you for sharing ! it’s always nice to come here. Hi Melanie! Thanks for sharing that story….although I do not know (yet) how to quilt, I look forward to starting my first project….that’s if I get my sewing machine for Christmas (lol)….God bless you and your family. Seasons Greetings! 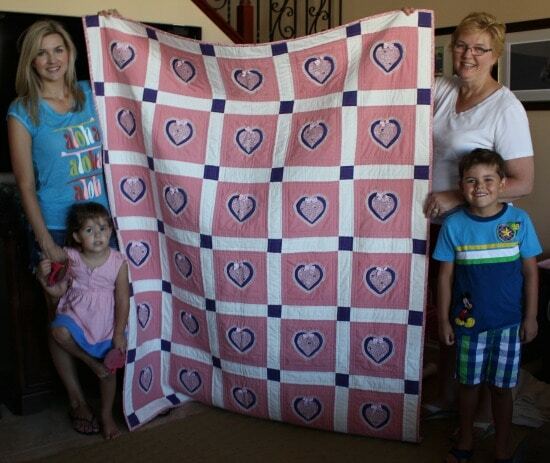 What a nice story, i have been taking classes for quilting and learned to make several square. I love it, i am so happy i found you because now i van continue learning more. I am also a srlf taught crotcher. Please continue sharing your talent so tradition van continue. what a lovely quilt, and the nostalgia attached with it is priceless… one things that quilters do, especially with a quilt like this, is to make a label for the back with the history of the quilt written (or embroidered) on it… you could use muslin and just write the names of your grandmothers, mother, you, and your daughter and the dates (or approximate dates) the quilt was worked on… priceless!! congratulations on a lovely family heirloom 🙂 love your blog and videos!!! I recently became a follower, after trying youtube for a vid to learn crocheting. I loved your site and learnt a lot from your video. First one I saw was your Baby Blanket in the Bernat yarn. Please keep blogging and youtubing, because you make things so easy. By the way, I am from the Wales in the UK. God Bless you and your lovely family and have a wonderful and happy Christmas. I would truly love to learn to quilt! I know how to sew so I’m sure it wouldn’t be too difficult, right?